We’d love your help. 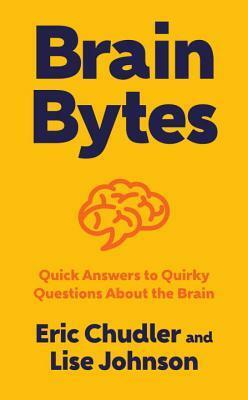 Let us know what’s wrong with this preview of Brain Bytes by Eric Chudler. From magazine covers to Hollywood blockbusters, neuroscience is front and center. This popular interest has inspired many questions from people who wonder just what is going on in the three pounds of tissue between their ears. In Brain Bytes, neuroscience educators Eric Chudler and Lise Johnson get right to it, asking and answering more than one hundred questions about the From magazine covers to Hollywood blockbusters, neuroscience is front and center. This popular interest has inspired many questions from people who wonder just what is going on in the three pounds of tissue between their ears. In Brain Bytes, neuroscience educators Eric Chudler and Lise Johnson get right to it, asking and answering more than one hundred questions about the brain. Questions include: Does size matter (do humans have the largest brains)? Can foods make people smarter? Does surfing online kill brain cells? Why do we dream? Why can’t I tickle myself? Why do cats like catnip? Why do we yawn and why are yawns contagious? What can I do to keep my brain healthy? To ask other readers questions about Brain Bytes, please sign up.